Looking for SiteGround promo codes and coupons? 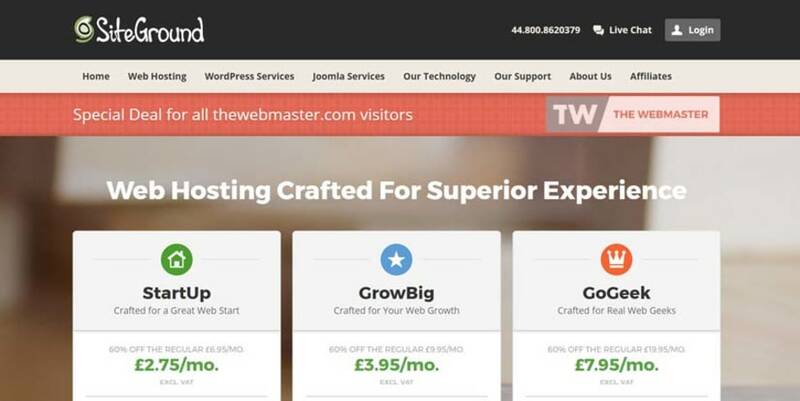 #MasterTheWeb and save money today with our exclusive The Webmaster offers. This is our standard SiteGround offer that gives up to 60% off shared hosting plans. Best to sign up for longer to make the most of this fantastic deal. 30 Day trial period backed by money back guarantee. Get 10% off all cloud hosting plans when paying 6-monthly or yearly. Includes PHP 7, HHVM and OpCache for ultimate performance. Get 60% off their StartUP plan with hosting just $3.95 per month. Best to sign up for longer to make the most of this SiteGround Promo Code. Includes 30-day money back guarantee. Get 60% off their GrowBig plan with hosting just $5.95 per month. This exclusive deal includes Premium Support, 30 days backups, NGINX, Memcached and more. Get 60% off their GoGeek plan with hosting just $11.95 per month. Includes more resources, and all their developer features, including Site Staging. Suitable for 100k plus monthly visitors. Get 5% off all Cloud hosting plans when paying quarterly. Includes PHP 7, HHVM and OpCache for ultimate performance. Free domain registration when signing up with any dedicated server plan. The discounted pricing is applied automatically when you click on your chosen offer. You will see the offer displayed via a banner on the SiteGround website as you will see in the instructions below. The SiteGround offer above will open up a new browser window, and take you to their website when clicked. Click your chosen SiteGround discount © The Webmaster. The next step is to choose your web hosting package. You will immediately see the choice of hosting plans (in the case of this guide; shared hosting plans). For most users, I recommend the GrowBig Plan. This provides premium support, 30 days backups, and all the speed related features. If you have a lot of traffic or want to use their developer features (site staging, Git), then choose the GoGeek Plan. The next step is to specify your domain name. If required you can register a new domain, although I recommend buying your domain separately (see this guide). You will also see the option to get your website transferred for free from your old hosting provider. Choose domain © The Webmaster. Hosting plan - Make sure that you choose the right hosting plan for your needs. I think that the premium support, 30-day backups, and full speed related features are worth an additional couple of dollars per month. Location - I recommend you choose a location that is close to the majority of your visitors. This increases website performance as your website files has less distance to travel from the server to the user. Extra services - Most web hosts will try and up-sell with additional services, and SiteGround is no different. If you are considering Premium Support, SSL, or their basic backup service I highly recommend upgrading to their GrowBig plan where these are provided free of charge. Once you have checked all the information and entered all your billing and personal information, you simply need to wait a few hours for everything to be setup for you. Check your order and enter billing information © The Webmaster. Without knowing your website, and how many visitors it gets it is difficult to provide specific advice. SiteGround does have some recommendations on the number of page views each plan can accommodate with their shared hosting, although this should be taken as a guide only as there is no page view limit attached to any of the plans. The StartUp Plan should be sufficient for 10,000 page views, GrowBig Plan for up to 25,000 page views and the GoGeek Plan for up to 100,000 page views. If you would like all their levels of SuperCacher (i.e. dynamic caching), then you should choose either the GrowBig or the GoGeek Plan as the StartUp Plan only comes with static caching. If you like the look of the developer features (Site Staging, GIT), then you will need the GoGeek Plan. If you want a little more control, and full SSD hosting along with their HVVM powered Cloud (which we use for this website) then we recommend their cloud hosting. In all cases, make sure to utilize one of our SiteGround coupon codes. 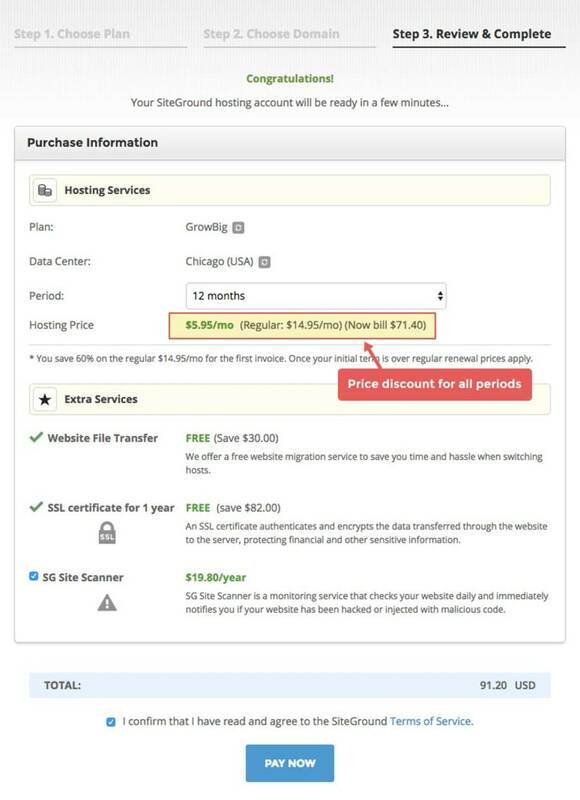 SiteGround offers a trial of their hosting for one month, but it is subject to a $14.95 setup fee to do this. After the first month, you must pay for the full twelve months as they do not have a monthly billing cycle. We do not believe this to be a cost-effective way forward. Instead of paying for a one month trial, we recommend you pay for a year and use our 60 percent off coupon. You then have 30 days to try them out, and if you decide they are not for you, you can request a refund under their money-back guarantee. SiteGround offers 12-monthly, two-yearly, and three-yearly billing cycles. For maximum savings, we recommend signing up for three years when using out 60 percent off coupon. 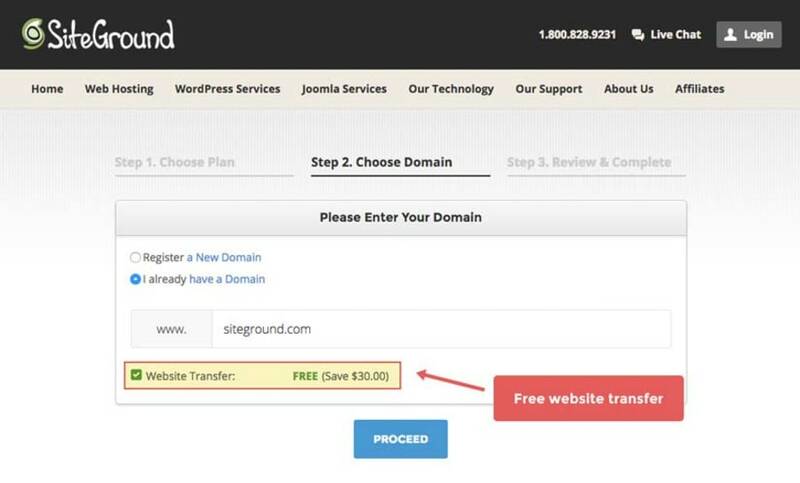 Does SiteGround offer a free domain? A free domain is not offered by SiteGround. According to their website, SiteGround only accepts payments via Visa or MasterCard credit \ debit cards only. That being said, we are aware of one customer contacting them via support ticket requesting to pay with PayPal, and they were sent an invoice enabling them to do so. We are unaware if this was a one-off or something they will do for all customers if requested. If this is important to you, we suggest you contact them directly. According to their website, SiteGround does not accept PayPal. However, as we mentioned above, we are aware of one customer that was able to pay by PayPal upon request. This seems to be confirmed in a recent tweet. You can request to pay via PayPal on their live-chat. SiteGround does not accept Bitcoin at this time. If paying by Bitcoin is essential, then we suggest Namecheap. 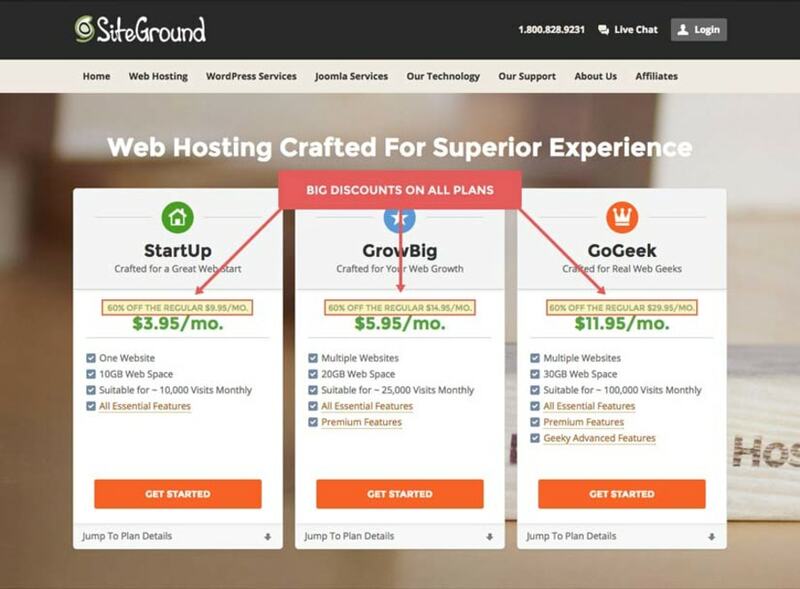 SiteGround offers a 30-day money-back guarantee for their shared hosting plans. The guarantee only covers the cost of the shared hosting. All add-ons \ third party services (including free domains) are specifically excluded. Cloud VPS and dedicated plans are also specifically excluded. Yes, the cost of hosting will go up once you renew, as the initial discount offered by our SiteGround coupons only applies to the first invoice. During the order process, the discounted rate and the renewal rate are shown. We recommend signing up for three years to make the most of the initial discount. What is the premium support option offered by SiteGround? SiteGround offer supports 24⁄7 via telephone, ticket, and online chat. They are renowned for their fast support, and our own experiences show that they usually respond to tickets within 5-10 minutes, although we have only ever used plans that come with their Premium Support as standard. Premium support comes free with the GrowBig and GoGeek plans, as well as free for the first three months on the StartUp plans. With Premium Support, your tickets are given higher priority in the queue with promises to resolve the issues more quickly. Also, submitting a support ticket is easier as you do not need to select a category for your support ticket. Without a doubt, we recommend having Premium Support, and specifically, we would recommend the GrowBig plan that comes with this as standard, as other great features such as all three levels of SuperCacher, and daily backups. Do I need the backup service add-on offered by SiteGround? In our opinion, yes. The backup service, which comes free with GrowBig and GoGeek plans and a small additional fee for StartUp plans, is essential. The Backup Service will store 30 days worth of backups for your account, so should you get hacked or do something that breaks your website you will have peace of mind that you can restore an earlier version. Moreover, you can restore specific files \ databases which are incredibly useful for fine tuning any restorations. You get 20 percent off the Backup Service when ordering at the same time as your Startup Hosting account, but as we said, it is more cost effective to purchase a higher plan that has this (and more) free. What is SiteGround?s HackAlert Monitoring? Is it worth it? This is a third party service (not included in money-back guarantee) that scans up to 10 random pages of your website each day searching for malware. If such code is found, you will be immediately alerted by email enabling you to take action. If no malware or suspicious code is found, you will receive a report each week showing which pages were scanned and the results. When you purchase the HackAlert monitoring at the same time as your hosting account, you will receive 50 percent off. It is billed yearly.